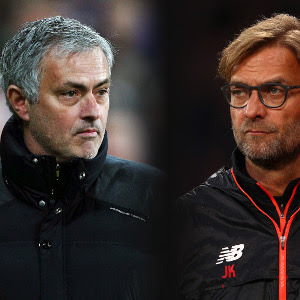 Manchester United have a golden opportunity to haul themselves into the Premier League title race at the expense of bitter rivals Liverpool this weekend. United go into the Old Trafford showdown in fine fettle after beating Hull in the League Cup semifinal first leg in midweek to extend their winning streak in all competitions to nine matches. Mourinho's sixth-placed side still trail Chelsea by 10 points and lag five behind second-placed Liverpool. "You know, at that time I had less time of working together with my players," Mourinho said. "Now I have a little bit more, we know each other better, we have a certain way of thinking football, we have a certain way to play football. "We don't just have good performances, we have also the happiness of the good results." In contrast to United, Liverpool – after emerging as title contenders thanks to a four-match winning run in December – have suffered a dip. A draw at Sunderland in the league was followed by an FA Cup stalemate against fourth-tier Plymouth and a 1-0 defeat in the League Cup semifinal first leg at Southampton. "We will try everything we need to make the difference," Klopp said. "Everyone who wants to see a real fight, then yes, watch it. It will be 100 per cent from our side." "I think the Leicester game is very important. It's important for us to restart winning," Chelsea manager Antonio Conte said before the Costa bust-up was revealed. On the field, midfielder N'Golo Kante will make a first appearance at Leicester since his £30 million pre-season transfer. Kante was the driving force behind Leicester's incredible title triumph and his absence has been felt as the Foxes have slumped to within six points of the relegation zone. Leicester boss Claudio Ranieri called on the club's fans to salute Kante, but he hopes his side can make it an unhappy return. "I hope our fans give to Kante a warm welcome as he was our champion. It's important to remember what he gave to us," Ranieri said. "We respect Chelsea a lot but we are ready to fight and ready to try to win." Third-placed Tottenham can extend their winning run in the league to six matches when they host West Bromwich Albion, but boss Mauricio Pochettino isn't getting carried away by that impressive success against Chelsea. "Today it's about maturity and learning from this period. It doesn't mean that we will win every game," he said. "It's important to show that maturity we did against Chelsea, that is important for trying to be more realistic and fighting for a bigger objective." Manchester City, in fourth, look to maintain the momentum from their FA Cup thrashing of West Ham when they travel to Everton, while fifth-placed Arsenal, eight points behind Chelsea, can't afford a slip at second-bottom Swansea. Taylor, who suffered a suspected heart attack, led Watford into the top flight twice in two spells lasting a combined 15 years and the club plan a minute's applause and other tributes before their home match against Middlesbrough.